Aagha Ali and Sarah Khan parted their ways with the end of the serial ‘Band Khirkiyan’. It was shocking news for all the fans out there who were waiting to hear the wedding bells. Both the actors didn’t say a word about their breakup or the reason for splitting up, however, the fans keep trying to guess what the reason might be. Recently, Aagha Ali shared the teaser of his upcoming breakup song ‘Main Haraa’ and it seems that Aagha has chosen music a way to convey his feelings. People on social media are showering their love for Aagha and wants him to reunite with Sarah. Talking about the song, Aagha Ali said that it is dedicated to all the people out there who have faced breakup in some point of life. “It’s for anyone who has been in love and has had their heart broken. I have. And I could relate to the song. I’m sure the world will too,” he added. Wait! Did You See Sarah Khan In The Aagha Ali’s Song Teaser? Well, social media users did. In the teaser, it can be seen that Aagha Ali throws a box which has letters, teddy bear and a picture frame of a girl. And the girl is quite similar to Sarah Khan! See it by yourself and decide! 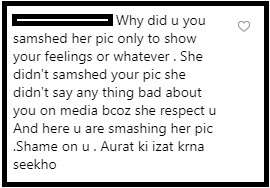 His Fans Are Slamming Him For Smashing Sarah Khan’s Portrait! So, People Are Asking Him To Respect A Woman! People Are Waiting For The Song And Aagha Ali’s Reply On This Issue! We Are Feeling Sorry For Both As Well! With the announcement of the breakup, both the actors cleared their Instagram feed where they had put up pictures with each other. In an interview, Aagha Ali opened up about his breakup and without blaming Sarah Khan, he said that it was the toughest time of his life. “It has been toughest for me to be honest. I could not work for months, I was isolated, I could not deal with it but then again, life has to go on,” said Agha. Aagha Ali said in his interview that it is fine from both the sides and we’ll continue to respect each other. “I immensely respect Sarah Khan, She is a fantastic girl,” said Aagha. Being aware of the upcoming reaction from his fans, Aagha Ali said to them in advance that think before saying as it can affect someone’s life seriously. “You guys have no idea what you’re saying and what effect it can have on somebody. Only because I shared certain stuff doesn’t mean I owe my life to anyone!” Let’s see if Aagha Ali clarifies the confusion regarding the picture frames in his breakup song or his fans continue complaining about it.